The Equivalent Exchange Mod is a Minecraft addition especially popular with players who prefer to play Minecraft for its extensive sandbox abilities. Equivalent Exchange adds alchemy to your world, allowing complex structures to be built more easily while using the same general crafting techniques of standard Minecraft. Many valuable or useful items in Minecraft take huge amounts of time to acquire if the player must look for every resource manually. However, for most players simply cheating to create the items would make the building process far less engaging. With the addition of alchemy to the game, the player may craft a new set of tools which take “EMC” energy from easily-found blocks and transmute it into rare and useful blocks and items. Once the player has become a successful alchemist, complex building projects that require very large amounts of rare materials can be accomplished with no tedious grinding. 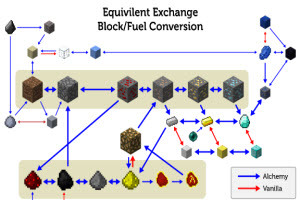 All the same, alchemy is performed using the same processes as normal Minecraft crafting, so the player’s immersion in the game can be maintained. The main elements of Equivalent Exchange alchemy are the added alchemy-themed objects. These are either used as new types of crafting tools or as means by which to collect EMC with which to perform the alchemical transmutations. For example, one of the first objects is the Philosopher’s Stone, which is used to create a Transmutation Tablet. This tablet acts as a crafting table, which can “learn” the formation of any object or block placed on it; the Transmutation Tablet can then use EMC to transmute anything placed on it into any type of item it has “learned.” Once you’ve used items like the Energy Collector to acquire fuel, you’re on your way to stress-free building projects.